If you look back at history, there has been merchandising of movies since the beginning of the artform. Movie fans like mementos of their favorite films. Throughout the 50s and 60s, toys based on movies became very commonplace. But, things really changed in 1977 when Star Wars blew open the concept of movie merchandising, as there were toys based on nearly every characters in the film. Then, in the 80s, things took a turn. Instead of getting toys based on TV shows, we were getting TV shows based on toys with things like Transformers, G.I. Joe, and Go-Bots. This blurring of the lines stank of rampant consumerism, but kids ate it up. This trend continues to this day, as Warner Home Video rolls out another entry into the Batman Unlimited series, which is taken from a new line of toys. Batman Unlimited: Monster Mayhem opens on Halloween night as Solomon Grundy (voiced by Fred Tatasciore) and Silver Banshee (voiced by Kari Wuhrer) escape from Arkham Asylum. They are soon joined by The Scarecrow (voiced by Brian T. Delaney) and begin terrorizing Gotham City. Batman (voiced by Roger Craig Smith), Green Arrow (voiced by Chris Diamantopoulos), Nightwing (voiced by Will Freidle), and Red Robin (voiced by Yuri Lowenthal) attempt to stop the bad guys, but are unsuccessful. This is followed by a series of seemingly random robberies and kidnappings by this group. It is then revealed that The Joker (voiced by Troy Baker) is behind everything. His dastardly plan will not only put the world in jeopardy, but test the heroes to their limits. When the first entry in the Batman Unlimited series, Batman Unlimited: Animal Instincts, was released just three months ago, I had my doubts. Once I learned that it was based on a toyline, I had expected it to be not lame, but very watered-down, as its intention would be to move products to kids. I was pleasantly surprised to find an action-packed little movie which was actually fairly violent (relatively speaking) and didn't hesitate to show the world in peril. I also liked the mixture of characters, as (up until recently) Green Arrow and Nightwing don't get much exposure in pop-culture outings (outside of comics). I still don't know about this Red Robin. Every time he is called by name, I automatically say, "Yum!". Batman Unlimited: Monster Mayhem also carries on the leaning towards high action. The movie opens with the escape from Arkham and rarely lets up from there. There is a nice mixture to the action as well, as each character is allowed to get involved, almost to the point that Batman takes a backseat at times. (The show is not shy about featuring Nightwing.) We don't get a truly maniacal joker here, but there is a nice balance between him being goofy (he drives a motorcycle made from amusement park rides) and sinister (he is trying to take over the world after all). The finale is interesting and highlights the movie's futuristic setting. And, was that a Joker mech? I only have two complaints about Batman Unlimited: Monster Mayhem. First of all, and this is nitpicking, this entry is far too similar to the first one. We get a group of heroes, a group of villains, Gotham is almost destroyed and then its over. It's not a carbon copy, but it certainly shows a pattern. Secondly, while the movie does fulfill the promise made by the cover of having Batman ride a dinosaur, it doesn't go as far as one would hope. That aside, for a project which could easily show little effort, I like the creative spirit of this series. Will The Ratcatcher appear in the next one? Batman Unlimited: Monster Mayhem does little with its Halloween setting on Blu-ray Disc courtesy of Warner Home Video. The film has been letterboxed at 1.78:1 and the Disc contains an AVC 1080p HD transfer which runs at an average of 18 Mbps. The image is very sharp and clear, showing no grain and no defects from the source materials. The colors are very bold and look great, and there is no bleeding over of colors. The image is never overly dark or bright. The level of detail is good and doesn't reveal any defects in the animation. The Disc carries a DTS-HD Master Audio 5.1 track which runs at 48 kHz and an average of 4.0 Mbps. The track provides clear dialogue and sound effects. The track does a good job of mixing stereo and surround effects during the action sequences, most notably when it involves sounds moving from side-to-side or from front-to-back. The subwoofer isn't wall-shaking, but it certainly adds to the action sequences. 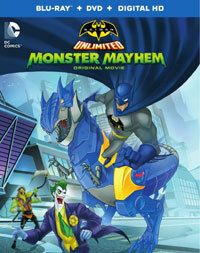 The Batman Unlimited: Monster Mayhem Blu-ray Disc contains several extras. In "Gotham of Tomorrow: Designing A Future World" (11 minutes), Writer Heath Corson, Background Supervisor Robert Haverland, Background Designer John Paik, and Producer/Director Butch Lukic discuss the creation of the look of the show, from the initial ideas to the inspirations. This includes examples of concept art. We get an episode of Batman: The Brave and the Bold. The Disc includes 10 "DC Nation Shorts", which are brief vignettes which feature Shazam!, Green Arrow, Riddler, Deadman, and Animal Man.